For 20 years the Mountain Legacy Project (MLP), based at the University of Victoria in the School of Environmental Studies, has been using repeat photography to explore change in Canada’s mountain landscapes. With historical photographs of remarkable fidelity assembled and digitized in collaboration with Library and Archives Canada, MLP teams determine locations the historic photos were taken, go to the same place, and rephotograph the images as accurately as possible. The historic and modern images are then aligned, analyzed, used by MLP for research, and made available to scholars, students, government agencies, and anyone interested in exploring change in Canada’s mountain heights. MLP began working with BC Parks in 2011 when we repeated select images from the Mount Robson area in support of graduate research on management challenges in remote landscapes. 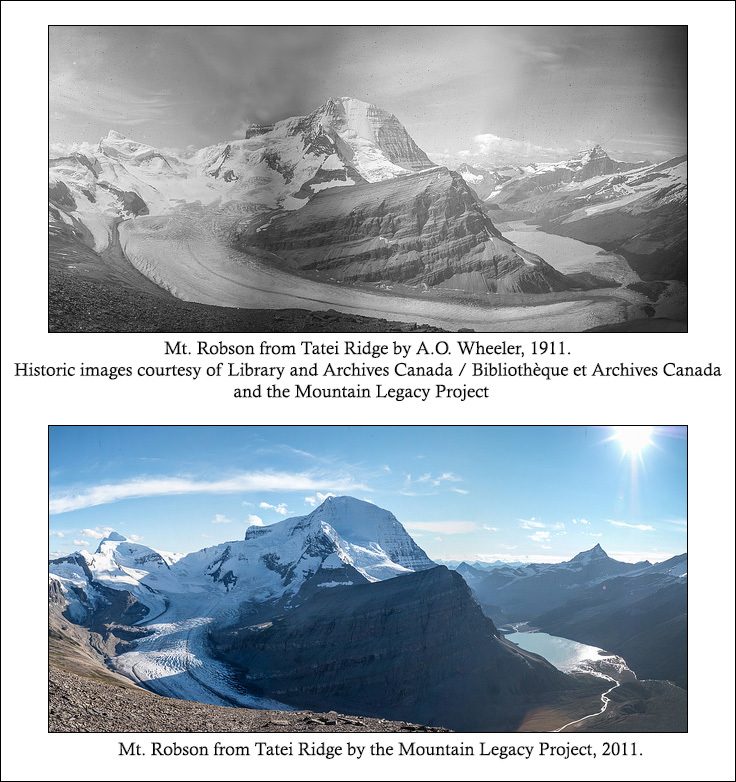 In 2017, the Living Lab for Climate Change and Conservation Program funded an assessment of existing and potential image collections further associated with Mount Robson Provincial Park. These include 237 images taken by Arthur Wheeler in 1911 and 22 modern images from the same locations taken in 2011 and 2012. Orange markers indicate stations with historic and modern imagery. Purple markers indicate stations with historic images and blue markers indicate known stations with no digitized imagery yet. Wheeler, a land surveyor, mapper, mountaineer, and co-founder of the Alpine Club of Canada, led a 1911 expedition into what is today’s Mount Robson Provincial Park. Funded primarily by the Government of Canada, British Columbia, Alberta, and the Grand Trunk Railway, Wheeler’s purpose was twofold: survey and map the area using photo-topographical techniques and determine where the Grand Trunk Railway might best place a grand hotel. Wheeler and team travelled under the auspices of the Alpine Club of Canada and the Smithsonian Institution. They began the journey in Edmonton on July 1 and disbursed on September 18. Their passage around Mount Robson proceeded counter-clockwise, coming over the Yellowhead Pass into the valley of the Fraser River, up the Moose River, through Robson Pass, returning down what is today’s stunning Berg Lake Trail to the Robson River and back to the Fraser. Although the historic map was one of the key expedition outcomes, the detailed photographs taken to help make the map are the real treasure trove – at least for MLP purposes. 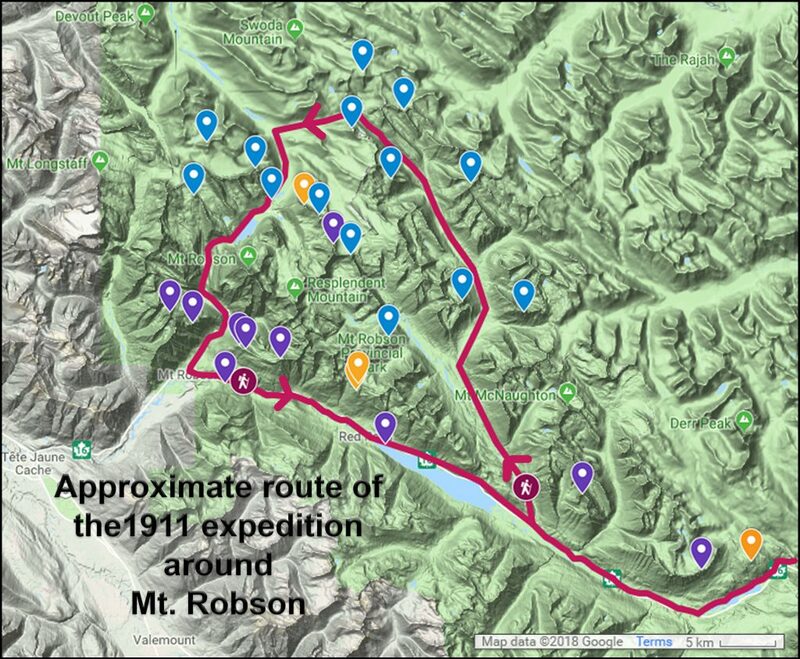 In all Wheeler took photos from 28 specific locations in the Mount Robson area. When compared with the historic images, the repeats show considerable loss of permanent ice – an indication of climate change at work in the park. The historic/modern panoramas overlooking the Robson Glacier from Tatei Ridge illustrate this very well. Other more subtle, but equally interesting and thought-provoking changes are revealed when we examine vegetation. The Red Pass panorama shows increasing and infilling coniferous vegetation as well as up-slope treeline creep. Although not the entire story, such vegetative transformation points to climate change. Modern images taken in 2012 by MLP. Historic images by A.O. Wheeler, 1911 and courtesy of Library and Archives Canada and the Mountain Legacy Project.